One of my all-time top-five favorite memories of life in a marriage ironically involves one of my least favorite things to do. I say that now so I don’t lose you as you jump ahead to find out what I’m talking about. Back in the 1990s, when the wind beneath my wings and I could still tolerate lengthy amounts of time across great distances in the same vehicle without secretly wishing the next pothole would send the mocha latte double fat caramel frilly drink for which we had to make a special stop because one of us didn’t feel like a normal morning beverage today at the regular morning beverage and gas-up store into one if not both nostrils, Karen and I would make a game out of road trips. Now that we’re old and tired of one another’s crap, the only game we play in the car is How Long Before She’s Asleep and the Snoring Gets So Loud it Drowns Out the Music So I Turn it Up Louder and Get Yelled at for Playing the Music So Loud She Can’t Sleep. Mattel makes it. Comes in a home version as well. But we used to make road trips fun. On short trips, like over the river and through the woods to my mother’s house in Columbia County, we’d sing the theme song to “Gilligan’s Island” over and over and over as the kids, still in their infancy and not yet soiled by adulthood and its incumbent responsibilities and spouses, would laugh from the back seat and, in unison, yell “AGAAAAIN” over and over. On longer trips not involving the kids, we’d make up games, most of which revolved around movies or TV or music or other very important and highly smart topics like the global budget warming deficit plague forest meeting in the Hague. Also, food. We had to do something to keep from going insane or start hating each other’s idiosyncrasies or aromas. Thankfully, those days have passed and reality has finally set in. But during those days, we once decided we would head off into the Hudson River Valley to Hyde Park and check out the mansions. As a child, mom and I (making up songs was the car game mom and I played) visited FDR’s house and the Vanderbilt mansion. I loved it. As, I wager, have those of you who also know this experience firsthand. I’ve always felt the Hyde Park trip is one of those things that should be mandatory for all New York state residents. We have a lot of really cool things in this state that we too often take for granted and for which families from every corner of the globe save up their hard-earned cash to see. Some of the larger ones are obvious: Niagara Falls, New York City, my childhood bedroom. Some of the others are much less famous yet no less worth the time and effort. New York state is its own destination and I bet there are a shameful number of New Yorkers who haven’t seen a lot of our cool stuff. Anyway, among that stuff is Hyde Park. You should go. So, about 15 or 20 years ago, Karen and I made plans to spend the day there — to look at all the rich people stuff that we could never afford, see how lavish our lifestyles could have been if we were born into it, and stand behind a lot of velvet rope lines. Karen, to her credit, has also sort of been on a “dead presidents tour.” Something she came up with all by her lonesome after she realized she had been to the gravesites of a couple of former presidents. She hasn’t seen that many, but whenever we travel, we try to determine if there are any underground presidents within driving distance. Seeing FDR’s grave in Hyde Park was another notch in her perhaps gruesome yet enterprising little belt. The day we went to Hyde Park it was especially hot. And the air conditioner in my vehicle had decided to conk out. Somehow, we didn’t kill each other. I think it was because we were still young and didn’t yet realize it was an option. After trips through both mansions and a trip through Eleanor Roosevelt’s home-away-from-mansion, I was ready to eat. And in no mood to drive around a strange town looking for a joint agreeable to us both (offering food for her and a long-handled tap for me). While walking to our car in a shaded parking lot at FDR’s house, we noticed picnic tables, also in the shade. Karen told me to go grab one. With my back to the car and all the futzing she was doing in the trunk, I sat clueless. A few moments later, she plopped down in front of me and between the two of us a completely packed picnic basket. Greatest surprise she had ever pulled off and to this day one of the coolest moves she has ever made. Somehow, she had managed to stock up on the food, make sandwiches, desserts, various other treats, beverages, all neatly packed with those blue icy cooler things. Plates, napkins, everything. I was astonished. Not only because I know everything that’s going on always when it comes to house stuff and the preparing of food by her. But she was also able to sneak it into the car without me knowing it, and found the perfect time to break it out in the perfect location (she got lucky here, believe you me). Makes me feel bad that I pick on her car snoring. But there we sat, under giant pine trees on the Roosevelts’ front lawn, plowing through tuna and egg salad sammies, some kind of decadent brownie/cookie something, and cold soft drinks. We discussed the day we had thus far enjoyed. I had completely forgotten about how hot it was and how much I hated picnics. Knowing my dislike for eating outdoors and all the ridiculous machinations accompanying it, the wind beneath my wings still, with her eyes closed, threw a dart at a target 100 miles away and hit it dead center. And I am aware that I may be in the minority when it comes to the eating outdoors thing (even though I remain King of the Grill). That’s OK. We all follow our own paths. Some day, we’ll get into the whys and why nots of this particular flaw in my ointment. I’m sure it’s partly based on the fact that no picnic will ever rival the one that, while still young and friendly, caught me by surprise on a blistering hot summer day and a dead president’s front yard. Can’t tell me the romance of young love was wasted on this Romeo. Morning has long been my favorite time of day. I didn’t start appreciating it until about 30 years ago when my profession demanded I start playing a larger role in it, and I’m glad I did. Because even though it comes too darn early every day, morning is one of life’s better things. The food is better, the temperature is better, the sun is friendlier, the birds are in full throat, the neighborhood is not quite yet awake, the nut heads we run into on a daily basis have yet to ruin the day. 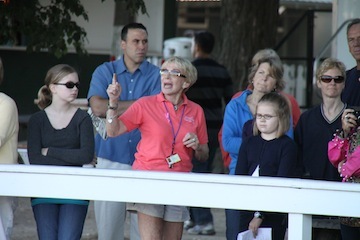 Trainer Glenn DiSanto, left, watches Keyaly, with Lorna (pink) and Greeley's Law with Amy break from the gate during schooling in 2010. Morning has a lot going for it. Especially morning at this time of the year. I’m not talking about the morning commute time of morning. My love affair is with the hour or thereabouts before sunrise and the hour or two right after it. Before idiots leave their houses and start ruining everything. The sounds the earth makes at that time of day are more crisp, resonant, pronounced. Even the sounds made by the garbage truck, once a week, are no bother. The neighborhood is waking up. Just clearing its throat. 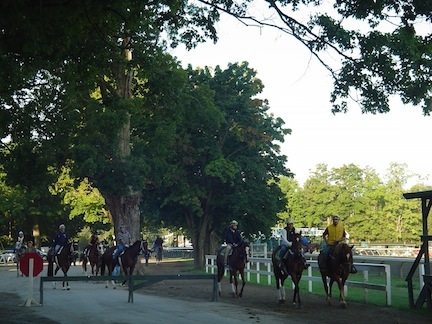 Time of day is a big part of why I am head-over-heels infatuated with the morning training ritual along the backstretch at Saratoga Race Course. Being a partner in a race horse has more levels of excitement attached to it than I ever imagined. The benefits are too numerous to mention. Morning is one of them. The horses and people are also OK, I guess, but if it wasn’t for morning, they wouldn’t be around until later and I’d already be gone. The welcoming sights and sounds of another day dawning take on an entirely different feel when they are punctuated by hooves falling in rhythm on a paved lane. It’s an awesome privilege to stand, watch and listen as the world’s most powerful athletes snort their way through their daily paces — whether they are in a full-out breeze or a more relaxed gallop. The sun’s gradual appearance in the midst of the workout routine forces the fog that shrouds the main track and its picturesque infield to reluctantly lift, revealing the giant grandstand beyond; its red and white stripes bathed in the yellow of the day’s first light. 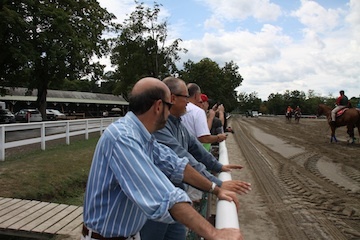 On race day, the fans who fill those grandstand seats can be heard as the horses make their final turn for home and sprint to the finish line. It’s a crescendo that at first is unexpected and surprising, and adds color to the atmosphere. Early each morning — almost like clockwork — a small number of geese that hang out on the race course’s infield pond (I like to think it’s one extended family; perhaps they’re complete strangers; hard to tell) takes off for breakfast. They honk their way southeast over the working thoroughbreds too busy to notice. They return an hour or so later. I’ve never really paid attention to how long they’re gone — I only notice their departure and return. I’m always too busy marveling at the rest of my surroundings. Leaning on the backstretch rail at this time of day, eyes and ears open to the bustle of activity, is like standing in a swarm. A giant, equine swarm. From behind one can hear the horses — by the hundreds — clopping along the macadam, either heading out for their morning run or heading back to their barns, where they will be bathed, walked, cooled down, given a little nosh, and spend the rest of their day. In front of us, from one end of the track to the other, hundreds of horses are taken through their paces. And when these are done, hundreds more follow. Every morning. A tour guide fails to point out the photographer. During the thoroughbred racing season, which begins — not a moment too soon — this coming Friday, being immersed in this scene also affords us fortunate souls the opportunity to become part of the backstretch tours. It’s not part of a plan; it just happens. 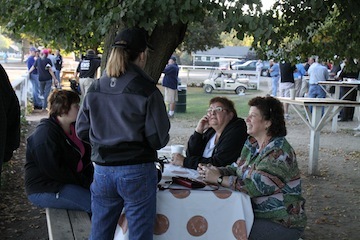 Racing fans who arrive at the track early in the morning and sign in at the main gate are taken by tram to the backstretch, where they learn the history of the grounds, they see the horses in training, they visit some of the barns. They mingle with those of us who have this pleasure on a daily basis. Photographer Jeff. http://www.topofthestretch.com - his photos will blow you away. I’m thinking of writing something for the tour guides to say the next time one of their groups surrounds us breakfast clubbers. My little contribution. It is an entirely different world, this one for which we early risers find ourselves blessed and of which we can’t get enough. It’s a side of the sport to which I had always paid the least attention. Until we became involved in partnerships last summer, the most thought I put into a day at the track involved the beverage-to-food ratio I planned to cram into which cooler I dreaded lugging under the burning hot sun. Too much food can cut into the beverage quotient (the most important quotient). Too little food can make m’lady distraught. jim, sharing his recipe for beans and greens and for picking winners. And, of course, with food, come the accompanying condiments, cups, plates, napkins, utensils, chip bags, cracker boxes, plastic containers. Picnics are a logistical nightmare and not worth the effort. I would have a lot more respect and appreciation for the notion of a picnic if it … 1) didn’t involve food that has no business being outdoors, uncovered, under the burning sun of summer, 2) came with comfortable chairs, 3) didn’t involve me, and 4) wasn’t for bugs. Oh, and the schlepping. A picnic involves way too much schlepping. Laura, Carmella and Jean hold down the picnic table against blue-clad insurgents. The group of new best friends which, to our good fortune, has welcomed Karen and I with open arms (and demands for my zucchini recipe), has perhaps been the most surprising and rewarding aspect of this life on the backstretch deal. I haven’t figured out yet if it’s a trait of horse people or unique to just this group (or maybe it’s because they also have learned to like mornings), but I have never made friends this quickly before. And not only because I’ve never been a big fan of people. In life, every sunrise is a gift. At no time have I found that to be more accurate than today, with elbows on the rail, a yellow sun at my back, and a swarm of thoroughbreds filling my field of vision. 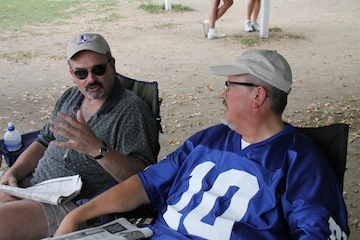 Trainer Glenn DiSanto, Joe D'Agostino, Sonja Augusta Rossi on Travers morning, 2010. Well, we’ve learned irony is a cruel beast. We’ve learned plans don’t always go as planned. We’ve learned the idea of spending some of this year’s vacation money on much desired domestic face-lifts is easier to dream than to execute. We’ve learned “execute” is probably not a good glossary term to have in your head when you’re trying to make decisions on a domestic face-lift, especially after losing all connection to the outside world, thanks to the severing of a little, orange, underground wire. We’ve learned that calling before you dig is not only a law in the state of New York, it is also a tried and true way to mark — with painted yellow and orange stripes and blaze orange flags — on your property the exact location of underground wires so the bubble-headed twentysomethings who have spent the majority of the week turning your lawn inside out know exactly where to dig in their addlepated and unsuccessful attempt to avoid severing your access to cable television, telephone and Internet service, which you, for an equally addlepated reason, assumed would be safe from harm. Silly you. Actually, silly me. Part I of this brilliant plan has been the fence project, which just concluded on Wednesday of this week. Would have been sooner, if I had read the contract. But because I’m like everyone, I just went OK, yeah, fine, whatever, “The Sopranos” are coming on, let me sign this and get back to my more important life. Hands were shaken (shook? shooked? shooken? 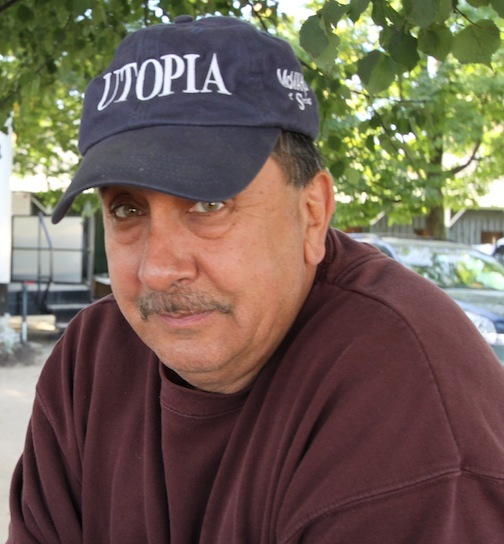 ), plans for the giant delivery of driveway-filling fence pieces were made for Monday, June 27, and work was scheduled to begin the subsequent Tuesday. And, because we learned it would take “about a day” (five, 10 minutes) to install this puppy, we were well on our way to new fence ownership. Until, on Sunday the 26th, while I was mowing the yard in anticipation of its being torn to shreds by power augers and cement mixers, it dawned on me that much of the scheduled activity was to take place in the very spot in our yard where I know every one of our cables is buried. The entire house is plugged into lead cords that run right through the placement of the first post hole to be dug. Funny, I thought, that no one mentioned we should have this mapped out in the obscure chance that expensive, ironic damage could result. Karen and I — in delayed flashes of brilliance — decided it would be a good idea to check the very important paperwork. And there it was: Call before you dig. With delivery the next day and fence work scheduled in two days, I called the “call before you dig” hotline and learned it takes four days, according to the state law I was quoted, to accomplish the mapping and marking necessary. The number of pieces to the puzzle known as “the big-box installation project” is more than I had imagined. The guy who sold us the fence and failed to point out my stupidity, the guy in charge of the delivery, the guy in charge of the crew which was in charge of the actual work all had to be found on a Sunday afternoon and have their work schedules rearranged because their digging couldn’t commence until the lawn was painted. I completely blame myself, although the big box has already heard my objections to the way business is conducted. The paragraph right above my signature on the contract, had I read it, clearly states that before work can commence, it is up to the homeowner to make arrangements for the labeling of locations of underground wiring. I contend, and I have spousal backup on this one, that the big box representative should be responsible for pointing out that the “call before you dig” thing is pretty important. We wouldn’t, after all, want any of our cables severed. Also, because it’s the law. The process was — to me — surprisingly easy. One phone call to the power company formerly, yet still conveniently, known as NiMo was all it took. The person answering the phone seemed to know where I was calling from (probably by looking at the Internet) and also knew who to contact for digging privileges. She rattled off my TV/phone/Internet company, water company, town culvert people, in addition to her own power company — there was a list of seven in all — who needed to come to the house, draw all over my grass, stick flags everywhere, and give me the thumbs up. If I was to give you one guess, and not because I mentioned it above, would you be able to guess which underground cable, I was informed Tuesday evening, was — oops — accidentally severed? Let me give you a hint. The tiny exercise in word use which you are presently reading is being banged out with furious thumbs upon a battered and bloodied iPhone in front of a dark television screen on a Tuesday night because that is when I learned that the only underground cable that was clearly marked in the entire construction zone had just been compromised during the backfilling of a post hole. The pre-hormonal installation crew had dug the giant hole, slammed a post into it, filled it with cement and gravel, and was in the process of raking the extra dirt back into the hole when — oops — Mr. Mattison, guess what we just did. And that’s when we learned that Mr. Mattison is surprisingly not bashful about the free expression of vulgarities, as they echoed off the confines of a brand new white vinyl fence. We also learned it would take a day to fix this giant gaff. In other words, five, 10 minutes. I do not take lightly the rare occasions upon which I am allowed to refer to myself as King of the Grill. I would, perhaps, if the title was self-appointed; if I decided that my big, shiny grill, long-handled flipping, spinning and turning utensils, and adjunct meat smoking vessel warranted a title change and bump in husbandly respect. Which it does. But that’s not my point. It is because of my neighbors, who, many years ago, bought me a sign that hangs high and proudly on the screen porch. The sign reads: King of the Grill. For this reason — the only reason I need — I come to you on this great American holiday weekend with helpful tips and advice for the meals you plan to serve on this celebrated occasion of outdoor food cooking. There is no need for gratitude. I do this out of the kindness of my heart and out of the respect I have for raw food. Yours included. Food should not die in vane. It should die, mind you, but it shouldn’t be served next to a warm mayonnaise-based salad covered in fly footprints. That would be in vane. And gross. 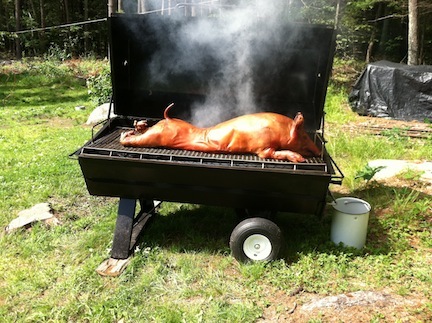 Sidebar: Speaking of dead food, I unintentionally stirred up a hornet’s nest last weekend by posting on Facebook a photo, from my innocent nephew’s innocent high school graduation party, of a whole innocent pig, lying prone upon a giant outdoor cooking vessel, suspended above a gigantic bed of smoldering wood coals. Mmmm. That’s how I want to go. With slathering sauce optional. And I know what you’re thinking. You’re thinking: He’s on Facebook? How cool is that? I am going to send this awesome guy a friend request right now. I thought a roasting pig, all juicy and moist and drippy and crackley brown, was a common sight at a pig roast. I thought taking a photo of this marvelous vision would be an acceptable, if not expected, responsibility. I mean, many others at the party were also taking its picture. Problem came, apparently, when I posted the photo on Facebook. Kinda one of those “nyah, nyah, look how much fun I’m having with my life right now which I bet is a lot more fun and much better than anything going on in your life” posts. Pretty much the reason Facebook was invented: To rub in the faces of nosy computer-owners who have nothing better to do than share all their boring pictures and inconsequential comments and whom after all these years of ignoring, you now consider to be your “friends” for the sole purpose of rubbing in their faces your much more glorious existence by forcing them to see if the last thing you posted is as captivating, inspirational and hilarious as the one before it. Well, the dead pig got the exact opposite reaction I was expecting. I thought I would get a thousand “likes,” a bunch of “yums,” and a smattering of “jealous(es).” Instead, I got vitriol. Which I initially thought would come in handy, because after all that fat-soaked pig flesh I needed a little something to settle my stomach. Then I realized vitriol isn’t the stuff old people drink for gas. “If slaughter houses had windows, we’d all be vegetarians.” “I don’t want my food to have a face.” “Poor little piggy.” … And these are the printable comments. I was derided by a complete stranger who rescues squirrels in her spare time. (Yes. Squirrel rescue is a real thing. … I know. Me, too.) She demanded I immediately cease posting on the Internet such horrific images. Then she deleted her comments — because she’s an obvious coward and incapable of constructive discussion — before I could respond. And with that, the little story comes full circle. I wanted to make sure today that before you run outside and set the world — and an entire 25-pound bag of briquettes — on fire because you’re cooking eight hot dogs for the holiday weekend family reunion, that you are first armed with the proper advice. If you’ve just unpacked and assembled your brand new GAS grill and for its maiden voyage you fill it with a different entire 25-pound bag of briquettes, soak them with lighter fluid, and touch them with flame, you need to re-read the instructions. I once had a neighbor who could have used this advice. Similarly and unrelatedly, if you turn on the gas under your gas grill, fire up the sparky-lighter things (Note: Glossary term; will be on the final exam), and you hear some of them light but you’re not sure all have litten, that probably means one or more hasn’t. If you then smell gas, it definitely hasn’t. Here’s the important part: If some are lit, one still isn’t, and that one is pouring gas into the immediate atmosphere, you are about to be treated to a very impressive flash and boom that will scare the bejesus out of you and impress the heck out of your Father’s Day visitors. We learn by doing. I have learned to never do this again. I have also learned that when eyebrows grow back, they’re never quite the same. In the helpful category of actual food use, and for those of you who have seen the pig photo on the Facebook wall, all veggies (which must be dressed in olive oil, salt and pepper) can and should be cooked on the grill. Most grills today have a cast iron griddle off to one side. It was made for veggies. Not corn, though. Corn goes on the main stage. Asparagus can cook on either surface. But the rest of the dead plants — spinach, broccoli, cauliflower, taters, beans, squashes, your entire aubergine family, fungus — come out finer than fine. I recommend veggies you’ve never before cooked on the grill. You’ll be pleased.